ACROSS THE GENERATIONAL DIVIDE « THE BRYCE IS RIGHT! – The Baby Boomers versus the Millennials, and beyond. There is a divide widening between the Baby Boomers and its succeeding generations, the Millennials. Both sides are frustrated and do not understand the other. What was commonplace in the Boomer generation is not so anymore, and the other generation look upon the Boomers as fossils who should be put out to pasture (and out of their way). The truth is both sides need each other if, for no other reason than to accommodate a smooth transition from one to another. * A different sense of “Class” – Office organization and decorum has changed considerably. Offices used to be very structured and tidy. This was done for two reasons: it was believed an organized office ran better if people knew where everything was, and; to demonstrate the professionalism of the office to its customers, thereby leaving a favorable impression and encouraging a longtime business relationship. Offices today are noticeably less tidy and more relaxed thereby allowing employees to think of it as a second home. Customers are no longer offended by disorganization in the workplace as it is essentially no different than their own office. Instead of encouraging craftsmanship and seeking perfection, there is now a tendency to settle for second best. * Focus of attention – instead of focusing on work products, the emphasis today is on the amount of time spent. Whereas the Boomers would think nothing of working nights or weekends to complete a task, their successors are obsessed with the number of hours they spend at work. * Compensation – back in the 1970’s you could hire a programmer fresh out of college for as little as $15K/year. Not anymore. Today, college programmers expect as much as $85K or higher, plus a signing bonus of perhaps $20K. According to a recruiter friend of mine, the idea of a signing bonus originated with pro-sports. If the student-athlete can get such a bonus for joining the pros, why not everyone else? In other words, young people fully expect hefty salaries without having to demonstrate their abilities. The concept of apprenticeship is no longer accepted. This is the antithesis of yesteryear where you started low and proved your worth over time. This represents a delineation of entitlement versus responsibility. Whereas the Boomers sought responsibility in order to demonstrate their worth, the Millennials expect entitlement. Not surprising, there is no corporate loyalty, and “job hopping” is the norm today. * Sense of history – whereas the Boomers were taught the background of their craft by their predecessors, the Millennials frankly couldn’t care less. By learning their craft, the Boomers were less inclined to repeat mistakes. I’m not really sure how well history is being taught to the Millennials. Recently, I overheard a college professor of management make the observation, “The PC did away with middle management in the 1990’s.” When I asked him to explain, he admitted he had generalized a bit but insisted the proliferation of the PC led to a reduction of many types of jobs, and claimed studies suggested a reduction in middle management due to this technology. I had a hard time swallowing this. During the 1990’s there was an effort to flatten bloated organizations a la General Electric’s Jack Welch (who earned the nickname “Neutron Jack” for such efforts). Interestingly, this approach was derived from Joseph Stalin’s purges of the Soviet government, not from the proliferation of technology. True, the PC helped reduce clerical staff, but I did not see it have much of an effect on eliminating middle management. However, it displaced clerical burdens on management; e.g. word processing, spreadsheets, etc.). Today, you do not see many secretaries in offices, which is a shame in my opinion. A good secretary could make an office run like a top. I still question the need to place clerical burdens on management. For example, consider air-travel; instead of contacting an in-house or commercial travel agent to arrange ticketing and reservations, we now spend an inordinate amount of time performing this task ourselves (with frequent screw-ups being common place). By doing so, we have substituted the professional with the amateur. * Interpersonal relationships – Whereas the Boomers were taught to master skills involving human relationships, such as persuasion, negotiation, presentations, interviewing, etc., the Millennials are more inclined to rely on technology to get their point across. Instead of trying to understand the requirements of their customers, there is more of a push to simply juggle numbers. This means people are viewed as nothing more than objects and not treated with respect. This phenomenon regarding generational divide is essentially no different than when the Greatest Generation was being replaced by the Boomers. To the Greatest Gen, the Boomers were perceived as more permissive, more tolerant of mistakes, and somewhat lazy. This shouldn’t be surprising when you consider the Greatest Gen survived the hardships of the Great Depression and World War II. The difference though was both sides found a way to bridge the gap. To illustrate, during the 1990’s, when aircraft manufacturers cleaned house and retired their older workers, they found themselves helpless when technical problems arose (anybody remember Clint Eastwood’s “Space Cowboys”? Same idea.). Because of this, companies are not so quick to eliminate older workers in the event of a reduction in the work force. Neither the Boomers or the Millennials understand each other and, as such, can find no room for compromise. Thereby the generational divide expands and gridlock ensues. The Boomers perceive the Millennials as addicted to technology and easily swayed by the media. They appear to lack social skills, work ethic, and empathy for others. Because of this, it should not be surprising that micromanagement is on the rise. This suggests the Millennials tend to go on auto-pilot and prefer to be told what to do. Each generation wants to leave its mark on the world, and each sees it a little differently. Perspectives and values understandably change over time. What one generation considers normal and rational, may not be so by another. It’s called “change” which is actually quite natural. The Baby Boomers learned the practices of the Greatest Generation, adapted, and modified them to suit their needs. Not so between the Boomers and the Millennials where the younger generation is ignoring the Boomers and inventing their own sense of reality. By not studying the past though, they are likely to commit the same mistakes as their predecessors. In other words, they are doomed to learn the hard way. The question next becomes, how will the Millennials relate to Generation Z who is now going through school and is much more imbued with technology than their predecessors. For example, 25% of two year-olds now have a smart phone. Their dependence on technology is much stronger than the Millennials. I suspect such technology addiction will cause another divide between generations, but not to the degree we are currently experiencing. Regardless of the reason, be it parenting, the Boomers dropping the ball, the effects of technology addiction, the brainwashing by the media, or changing moral values, a growing chasm exists between the Boomers and their successors, and I can see no way of stopping it other than to simply reach out to the other side and talk, and listen as well. NEXT UP: 50 YEARS OF THE BRITISH INVASION – Beatlemania started it on this date in 1964. LAST TIME: CELEBRATING THE 16TH AMENDMENT’S ANNIVERSARY – But are we getting tired of being the whipping boys for irresponsible government spending. This entry was posted on February 5, 2014 at 6:00 am	and is filed under Social Issues. Tagged: ACROSS THE GENERATIONAL DIVIDE, Florida, palm harbor, The Bryce is Right, tim bryce. You can follow any responses to this entry through the RSS 2.0 feed. You can leave a response, or trackback from your own site. This is the third or fourth of these Boomer vs. Millennial Articles I have read from you and I have to say I’m finding them to be more and more disrespectful to the Millennials and not a balanced look at the issues that are faced by generational diversity. 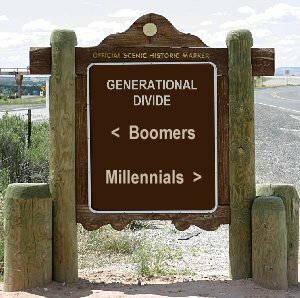 Even though the thesis of this article is to highlight the “chasm” of differences between the two generations, you only speak to the differences that you feel are the fault or the responsibility of the Millennials. Perhaps we could talk about the fact that while you say Millennials feel entitled, we are paying into retirement programs and Social Security that the Boomer generation want to strip and do away with, but with no consequence to themselves. Or how about the bankruptcy of our healthcare and banking systems under the watchful eye of our Boomer predecessors? I also feel that you are trying to rationalize change in our world as an “us or them” mentality, and writing these articles as if it’s based upon a persons age is only making that worse. The fact of the matter is the world is changing around us, not based upon how old you are, what you are, or where you came from. If you want to change with it, change. If not, don’t. I’ve worked with many Boomers who are more progressive than I am at the way they want to work and interact in the business environment, and many Millennials that are the exact opposite of the generalizations you list above. Perhaps the next article should be about ways Boomers and Millennials could better work together, instead of highlighting the chasm, write about the bridge. Otherwise, as your brother and friend, keep up the good work :-). Many thanks for your comments. As I point out in the article, this is all natural. If anything is constant, it is change. There are sharp differences in perspectives and values between the generations. What was considered natural in one, is not the same for another. Again, this is is to be expected. Nevertheless, it presents a significant problem in business when the generations cannot work together, and this is becoming more glaringly obvious in the work force. Because of our socioeconomic condition, Boomers are not retiring as fast as their predecessors. This means the Millennials have to compete and work with the Boomers which, in many cases, represents their grandparents. The chasm exists, but how do we work through it? As I mentioned, it is necessary to understand the perspectives of each generation and work towards a smooth transition. This reminds me of the transition of hosts for the Tonight Show; from Steve Allen to Jack Parr to Johnny Carson to Jay Leno, and now Jimmy Fallon. Although there was a relatively smooth transition between hosts, the leap to Fallon represents a significant change in the demographics of the show. As Leno said in his “60 Minute” interview, he understands the rationale for the change, but he doesn’t necessarily agree with it. He does realize though it is inevitable, as we should all be cognizant of. P.S. – Wait until Gen Z enters the work force! BTW, yesterday I gave a session on the need for “Craftsmanship” at the Future Business Leaders of America (FBLA) club at Palm Harbor University High School. Although many of the students rolled their eyes and kept looking at their watches or smart phones, there were about six or seven who understood what I was talking about and asked questions. I take this as a sign that there is hope. “Regarding your comments on compensation – Maybe this is a valid complaint. But, maybe, just maybe, we’re all forgetting that back in the 70’s the COST to the programmer/employee to get that education was a heck of a lot less than it is today. Using my own personal example, I can tell you I went to University of Tulsa from 1965-1969. This is a PRIVATE university. My tuition cost was $375 a semester for ALL the hours I wanted to take – there was no 21 hour limit. Back then, $375 was a lot of cash for a private school – because OU and OSU charged $50 a semester for IN-STATE tuition. The last time I was in Tulsa, about 10 years ago now for my sister’s funeral, tuition at TU was $26,000 a year – and there was a limit on how many hours you could take – no more than 21. So, it cost me roughly $3000 in tuition (and we’re not going to talk about textbook costs here) to get my degree in chemistry – give or take a bit – you also have those pesky lab fees and other “student fees” thrown in for good measure. So, let’s just say it cost me $5000 by the time I was done. I started work as an ENSIGN in the US Navy immediately on graduation (and remember, we still had a draft). My take home net – after taxes – was $211/paycheck with 2 a month – And, while some of that was tax-free, most of it was not. That’s a little over $5K a year which means my gross salary was probably around $10K a year. My wife made TWICE that without a degree as a programmer wherever we were stationed until she got her degree – then her salary jumped. She always made more money on the bottom line than I did as an officer in the military. You don’t join or stay in the military to get “rich” – especially back then. Now, fast forward to my daughter, who is a pharmacist. She went to school out-of-state (MT) and as I recall, my tuition for her was around $6000 a year for the first 2 years, then pharmacy school rates kicked in and it was more like $6K/semester. It turned out it was cheaper for me to send her to school out-of-state and pay room-and-board (we get a tuition reduction for being a part of WICHE – a consortium of mountain states) that it would have been for her to go to school at Colorado University here in Boulder and live at home and pay in-state tuition to CU. When she started working as a new registered pharmacist, her salary was like around $89K (average for the area and time she started) – which took ME a heck of a long time to reach even with a Master’s Degree in EE and 20+ years of experience and a high level security clearance. The interesting thing that this article says, is in what it doesn’t mention at all. GenX has long complained that it has been ignored and neglected starting as the latch key kids and moving on into adulthood as the generation that was not upwardly mobile due to the babyboom gaining position earlier and holding it longer than any previous generation. Now, as the somewhat bitter middle age generation that is still on the fringes of entrydom in position many are approaching retirement while watching millennial generation achieve on entry what has been mostly closed to GenX completely.